This is a story I have dined out on for many years. I enjoy watching people’s expressions when I casually drop the line: “Did you realize you have just been having dinner with a “living goddess”? I could write a whole chapter of my book about the reactions I have received! One cold, misty January morning, Ben and I boarded a local Benguet bus from the Philippines’ summer capital, Baguio City bound for Banaue further north in the vast Cordillera Mountain range. There was no way of knowing then, of course, that I was setting out from Baguio a mere mortal but would return a week later as a living goddess. 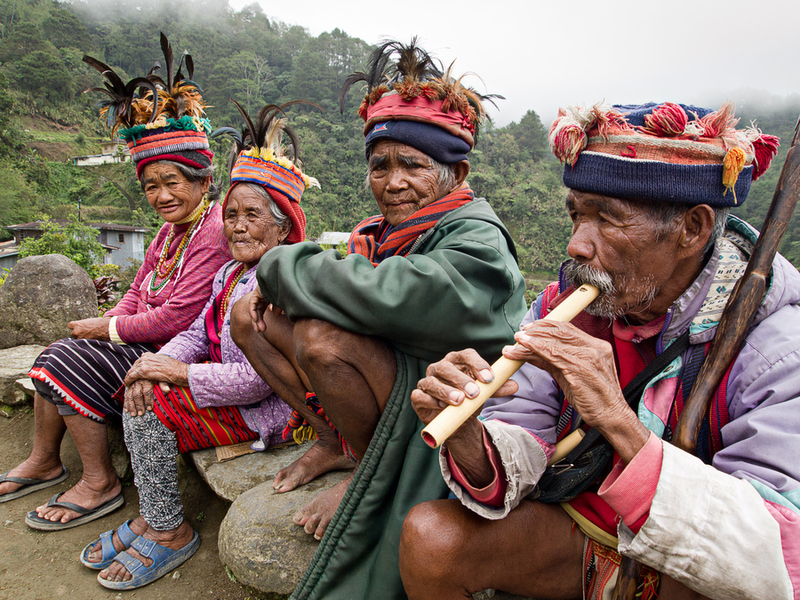 Banaue is famous for its fabled rice terraces, dug out of the sheer mountainsides more than 3000 years ago, by the ancestors of today’s Igorote tribes using only primitive implements. The terraces are known in the Philippines as the Eighth Wonder of the World but to the Igorote, Ifugao and Kalinga tribes who inhabit them they are referred to as the “Stairway of the Gods”. Reaching from valley floor to peak they exceed, in some places, 5000 feet. And, as I watched them appear and recede in the high altitude mists, it was easy to believe that they did, indeed, reach out into the firmament beyond space itself. 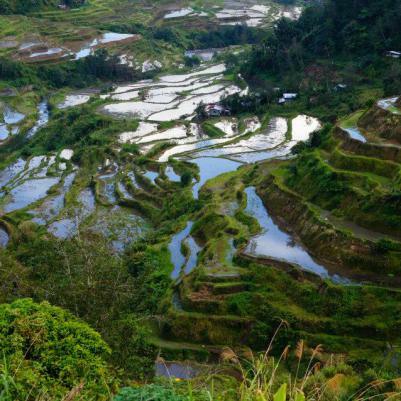 The irrigation system used for the rice terraces is also manmade. Little tunnels are built from earth and mud and channeled down from nearby waterfalls from one terrace to the next. And, as the shafts of sunlight reflect the water, the mountains are transformed into giant kaleidoscopes of shimmering prisms. The drive from Baguio itself was a long, arduous and dusty one. 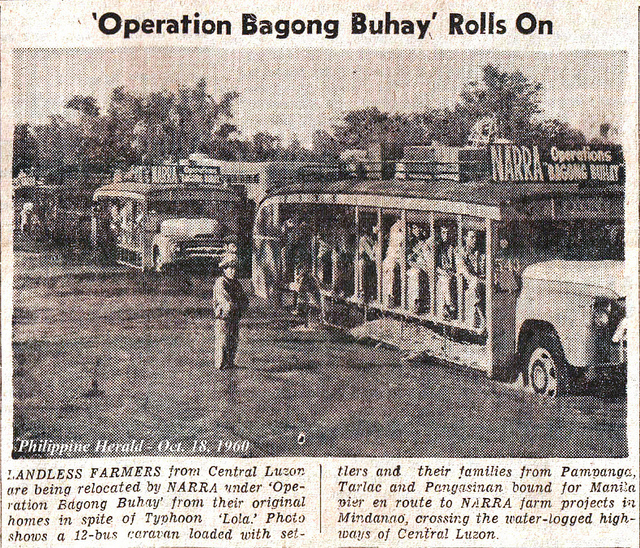 There was no choice of first or second-class transport, as on buses in other areas of Luzon. All were strictly third class. There was no glass in the windows on one side of the bus and, on the other, there was nothing at all. It was completely open. This proved to be not only terrifying on these winding mountain passes but also extremely hazardous. As the ancient bus ricocheted from side to side, the passengers were catapulted from their seats to within inches of death. I found myself automatically clutching on to anything that seemed solid, human, animal or vegetable, although I realized that in the event of us tipping over the edge, this move would hardly be likely to save my life. There were no tourists on the bus. I was told that very occasionally an American Peace Corps volunteer headed up that way to check out the area but even that was a fairly rare sight. And, as a result, I was an immediate oddity. The further north we travelled the more curious people became and the more they stared at me. The brasher ones stepped forward to touch me and then dissolved into fits of embarrassed giggles. The seats on the bus were composed of long, hard wooden benches. Soon into the 13-hour trip, I discovered, to everyone’s discomfort, that as many as twelve people could be sandwiched together side by side onto a seat that was designed for no more than six. 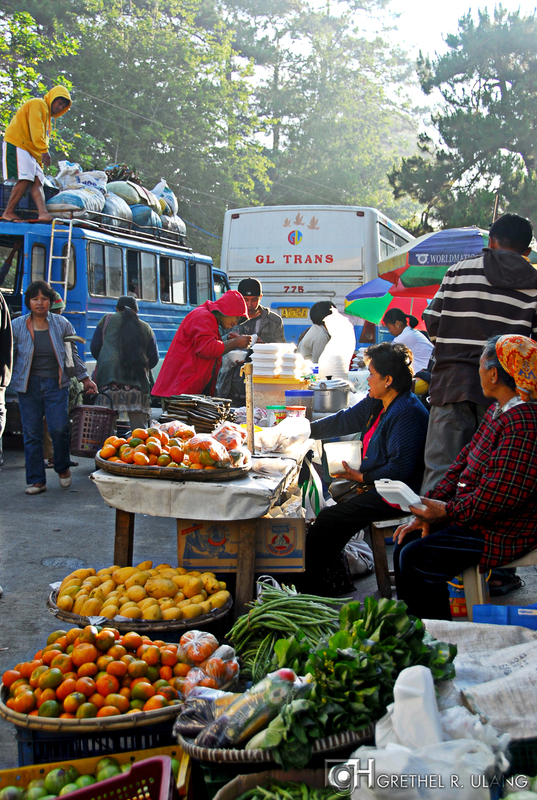 As the bus hurtled round the hairpin bends, the conductor clambered agilely over our laps and the assorted bundles of rice, vegetables, livestock and personal effects to collect his fares. As he came to the end of a row he swung himself outside the bus, clinging precariously to its open side, defying all gravity, as it skirted the cliff face at frightening speed. Although there were, apparently, set points along the route designated as official bus stops, the more inland we travelled, the more frequently it would come to a shuddering halt. No one along the road was denied a space if there was an inch of floor, roof or seat to be filled. Every so often people flagged down the bus, boarded it and then hopped off a mile or so further along. 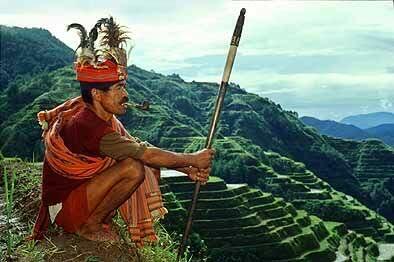 The local men, despite the cold January temperature in the cloud forest of the high Cordilleras, were clad only in their scarlet, yellow and green G-strings. They were on their way to market, many of them with their pigs and goats to sell. As if knowing their fate, the animals appeared reluctant to clamber board. 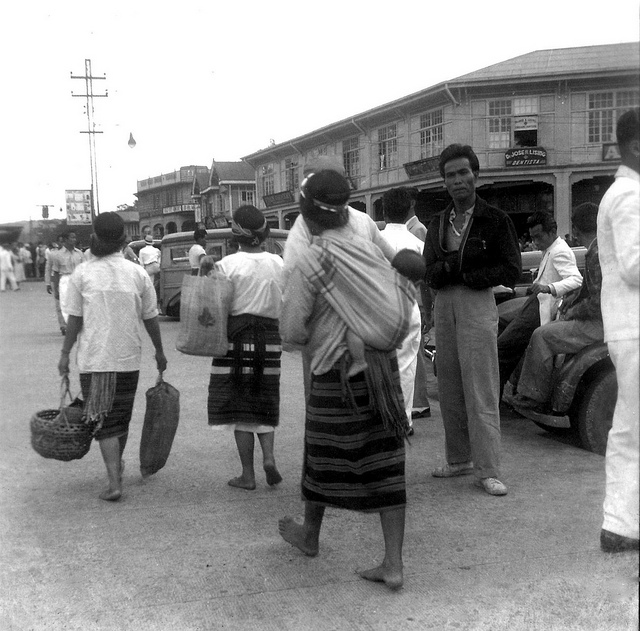 The women, bare-breasted in some cases, were wrapped in colourful skirts woven in native designs and loaded down with bulging sacks of vegetables and rice. Many of the older women displayed intricate tattoos on their arms, a sign that the male members of their family had once been proficient head-hunters in their time. It was on this trip that I became fascinated by the variety of images used in these tattoos and, on my return to Manila, studied the subject. I ended up writing an article about them for the encyclopaedia, “Filipino Heritage”, published four years later by Paul Hamlyn. As we proceeded on our journey the landscape changed from sloping grasslands to pine forests. The coconut plantations gave way to dense thickets of bamboo. And, dotted here and there, were native huts on stilts made from nipa palm and rattan vines and decorated with colourful window boxes and climbing bougainvillaea blossoms. Splashes of gold and yellow sunflowers stood tall against the smoke grey hills and vivid green rice paddies. All along the route, we passed stalls selling watermelons, papayas, avocados, mangos, bananas, sweet potatoes, coconuts and, even, strawberries. But, as we climbed steadily higher and closer to the interior, even these began to thin out. As I looked out across at the mountain terraces it was obvious that life in the Cordilleras was harsh and the tribes were, as a result, tough, hard-working and resilient. They lacked the spontaneity, the sense of ease and fun I had come across among the tribes in the central and southern islands. The Igorots appeared to spend all day bent over double planting rice, tilling the fields or irrigating the paddies using ancient ploughs attached to the passive and good-natured carabaos. Occasionally I saw women squatting on the rocks, washing their hair or clothes in the crystal, icy water. They were singing, chatting or simply sitting silently chewing tobacco or betel nut as they worked. And, although I never actually saw the latter, the chief said there were, apparently, a great many of both in these highland areas of the Philippines. He showed me some crocodile heads he kept as treasures in sawali (split bamboo) containers, along with some stone and wooden figurative carvings (anitos) used for ancestral worship. I asked the chief what happened to the snake and crocodile skins. I had noticed a few shops in the city specializing in crocodile and snakeskin bags, luggage, belts, shoes and other items aimed at the tourist trade but had always believed they were imported. We arrived finally in Bontoc, the last sizeable town before reaching the rice terraces of Banaue. Everyone was, at last, free to climb down from the bus, stretch their atrophied legs, go to the squat toilet and take a quick lunch before boarding the bus again. As soon as the bus stopped outside the marketplace, small children, like an army of ants, invaded from all sides, selling coca-cola, coconut slices, rice-cakes and local peanut brittle. Their mothers following them were selling grilled corncobs (mais) and cooked pink bananas (saba) that tasted more like potatoes. The women, constantly complaining of their meagre earnings and their hard life, did everything they could to encourage us to buy. One woman was so determined to sell her wares that she remained clinging to the side of the bus. She was still hanging on when it moved off unexpectedly and she was forced to make an inelegant leap to the ground. When I turned to look, she had survived intact but her basket of pink bananas had not. On the way to Banaue we stopped at off at the Sagada caves. These caves, the ancient burial grounds of another tribe, the Ifugao, were dank and badly preserved. Grafitti covered the walls. Names of local tribesmen coupled with those of American soldiers (from the Philippine-American war at the turn of the 20th century) were painted over the lids and sides of the primitive wooden coffins and limestone burial jars. Water dripped monotonously from the roof into a large underground lake. Stalactites clung precariously from the ceiling, threatening to fall, at any moment into the depths of the caves. As we approached Banaue we could already see the beginnings of the famous rice terraces. And, although I had been warned that January was not the right time of year to appreciate them fully, the visual effect was still inspiring. I called over the many heads in front of me to ask the bus driver if he could stop while I took some photos. Nobody seemed to mind. On these hazardous roads, nobody was in a hurry. The mountains loomed in on us from all sides, disappearing and reappearing into the clouds of mist. 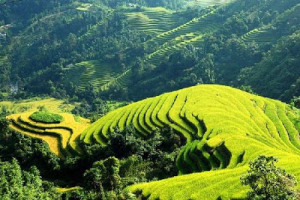 The water in each terrace mirrored the reflection of the terraces above it and the vibrant colours – red, green, yellow and black of the native G-strings, worn by the men planting rice, formed ever-changing patterns in the watery prisms. The guidebook claims that the highest of these terraces extends over 5000 feet and, spread out from end to end they would stretch from Manila to San Francisco. Other, more exaggerated claims would have you believe they would even reach New York or the moon. From this far-flung corner of the world, the moon probably seems no less remote and exotic to the local people than the Big Apple. Further along the road, on the way to Kiangan, the bus came to a halt. We all got down to help clear an overnight avalanche of rocks that were strewn over the road. It was noon and, though we were high up in the mountains, the heat was surprisingly intense. The road was extremely dusty from the rock fall and the local Ifugaos, having come prepared, swathed their faces and hair with wet towels. Unfortunately, we had not been forewarned and, because it was limestone dust, Ben,s hair by the end of the trip, was almost as blonde as my own. Our clothes, too, were totally whitened by the chalk and our skin felt itchy and uncomfortable. It took all of us two hours to clear the mass of rocks and boulders strewn across the road. We eagerly crammed on board again, each hoping to secure a better seat or space than our last. I was determined not to sit on the open side with the unobstructed view of the valley several thousand feet below. The driver noisily thrust the bus into gear and drove off, skimming the precipitous slopes, twists and bends with death-defying ease. A few miles further on, however, we were forced to a halt by another more recent avalanche. This time the giant boulders blocked the road completely. It was obvious we couldn’t manage alone so we waited, a little less patiently this time, for reinforcements to arrive on foot to clear the way. This, we were informed, would be a long wait. The passengers moved restlessly in their cramped seats, reluctant to give them up. Eventually, one by one, they got out to stretch their legs. The women, prepared for such an occasion, brought out picnics of fruit and rice cakes and large supplies of lethal, locally brewed rice wine. Clearing the boulders took almost all day. But, eventually, we set off. And, by the early evening, we arrived in Lagawe, in Kalinga-Apayao territory. The road, which had twisted upwards until this point, now descended abruptly and we soon found ourselves in a rich, green valley. Trees, which had thinned out close to the summit, now profusely overhung the road and the air was refreshingly cool. There was a large avenue down the centre of town lined by lush bushes of purple and pink bougainvillaea. The houses, evidently constructed originally by wealthy Spaniards, reminded me of the laconic lifestyle of the deep south, the white wooden verandahed houses of Savannah, Georgia or Charleston, South Carolina. Most of these in Lagawe were uninhabited, dilapidated and overgrown with thick vegetation, their luminous porticos gleaming momentarily in the occasional light of the moon as the clouds scudded across it, adding to what was already the eerie quality of a Spanish ghost town. This atmosphere was further enhanced by the approaching dusk and, with it, the evening chorus of cicadas and the abrupt darkening of the sky as the nightly cavalcade of fruit bats flew overhead in search of their evening meal. Children appeared in the road, emerging silently from behind the trees. Even they were muted as they passively watched the bus drive past. This was quite unlike the impulsive, rowdy reception and noisy greetings we had received in other villages along the route. Two hours later we arrived in Kiangan. It was already dark and much colder even than Baguio at night. We were planning to stay with Raymond and Rosario, anthropologists from Manila, who had rented the Mission House for their work. Our problem now was to locate the house. We enquired at the local sari-sari (grocery) store and the owner directed the way, as best he could, with a series of gesticulations and toothless grins. The path he pointed out was made out of roughly hewn stones and, as we made our way in the complete darkness, we stumbled painfully and often. Finally, with some relief, we spied the single electric light bulb swinging imposingly in the night breeze over the garden of the Mission House, in front of the local school. Raymond and Rosario were inside heating up some tinned food over a paraffin burner. 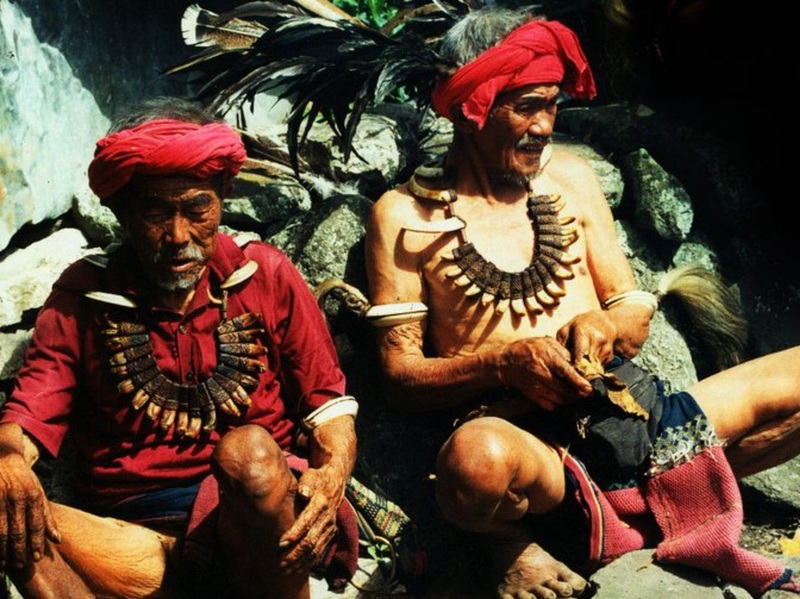 They were already familiar visitors to this place, carrying out research on Ifugao and Kalinga-Apayao folklore for the University of the Philippines. By the light of candles, we ate our dinner huddled gratefully around the log fire, our shivering, aching limbs covered in blankets, rugs and sleeping bags. Raymond and Rosario invited us to join them the next day as they interviewed some local chiefs and council elders. “Yes and it’s she who’s solely responsible for converting most of the non-believers in this area to Catholicism,” Raymond added. This knowledge somewhat saddened me but evidently gladdened the hearts of the nun’s superiors back in Belgium. That night, after we had sufficiently rested and warmed ourselves, we were fortunate enough to be asked to witness a local tribal ritual feast. The ritual we watched that night was called the canyao. The ritual can, he said, be performed to honour a tribal death or, as in this case, to celebrate the making of a hagabi (wooden bench). The hagabi is made from one huge, hollowed out tree trunk, which is dragged down from the mountains to the village by the men. These benches are strictly for decoration and status, only the more affluent men being able to afford the labour for the length of days it takes to make one. 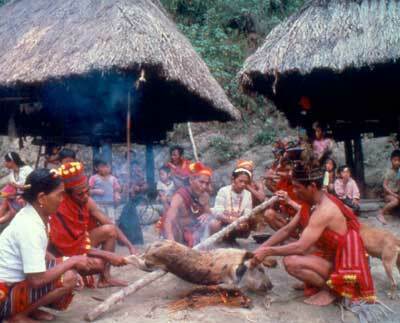 The day it is completed and installed beneath someone’s house is marked by the killing of a carabao followed by several days of feasting and rejoicing. I waited till Raymond had finished the explanation and then took my first visit to the Mission House bathroom. It was not an experience I was keen to repeat. Although the Belgian nun proudly boasted it was “western” in concept, it differed fairly drastically in that it lacked any running water whatsoever. This we had to draw from a well outside and carry in pails, jugs, pots and, even, glasses every time we wanted to go to the lavatory or wash. This in itself I didn’t mind. What I did find hard to cope with was that the water, being drawn straight from the nearby mountains, was icy. Exhilarating, no doubt, for some, but unbearable to others. The following morning, with the invigorating, pine-scented air and the sudden shining dawn, we awoke at around 5.30am. After we had each experienced our local ritual in the bathroom with many pails of water, we wandered into the kitchen for breakfast. Raymond and Rosario were already at work with their tape recorder and a typewriter. A local schoolteacher, acting as their interpreter, was busy translating their latest tapes. We ate quickly, anxious to follow Raymond into the village. On our way, he pointed out the Ulag, a dormitory for young girls that are still used today as a trial marriage house. Men are encouraged to sleep with girls to test their fertility. Some of these girls looked no more than twelve years old as they peered at us through the open windows. On becoming pregnant, a girl is released from the Ulag to marry the man responsible for her pregnancy. This tribal custom thus prevents any infertile marriages. A girl who sleeps with a man outside the confines of the Ulag will remain unmarried, although, inside the Ulag, it seems, she may sleep with as many men as she likes, a practice which is unlikely I would imagine, to determine the true father. We then strolled into the marketplace that was situated in a large plaza in the centre of the village. The vendors were squatting under the shade of palm and bamboo fans smoking the local tobacco. Even small children, no higher than my waist, were puffing on long thin cigarillos that were so huge they could well have served them as walking sticks. Everything here was for sale. Vegetables and fruits of all varieties, different types of rice, pigs, goats, chickens, Ifugao and Kalinga cloths, blankets, G-strings, local carvings and assorted plastic items such as combs and beads. It seemed the entire population of the village and surrounding areas was in the plaza selling or buying – but mostly bargaining – in shrill voices. One elderly woman selling vegetables, I noticed, had very valuable old beads, including some semi-precious stones and gold, crowning the twisted plait on her head. I asked her, by sign language, if she was willing to part with them. And she demonstrated that they were heirlooms and worth more to her than money. I turned to go but her greedy friends hovering around her stretched out and clasped my hair. They advised her to sell but not to accept anything under 100 pesos (6 pounds). She was nodding to them in agreement. However, when Raymond stepped forward proffering a 10 pesos note she readily pocketed it, her eyes gleaming with delight. After this astounding revelation there was nowhere in the marketplace I could go without attracting hordes of spectators and newly-converted religious fanatics wanting to touch my clothes, stroke my hair or clasp my hands. Even pregnant women came up to me simply to gaze. The interpreter explained that by staring at me in this fashion and making a wish the baby in the womb would look like me! Eventually, tiring slightly from this new-found celebrity we decided to head off for a walk to some less populated area. But, as we set off from the marketplace, numerous children followed me. To me, it was more reminiscent of the Pied Piper than the Virgin Mary. Small five-year-olds, barely able to walk themselves, carrying fat babies attached to their backs by yards of brightly coloured material, ran, stumbled and fell in their efforts to keep up with us. Raymond brought us to a large area of rice paddies. He prepared us to cross it because he wanted to show us a forest and a lake, some three miles beyond it, which formed part of a local legend. Crossing the rice fields at the best of times was hard. Crossing them followed by countless children weaving in and out of your path was, as I found out, impossible. 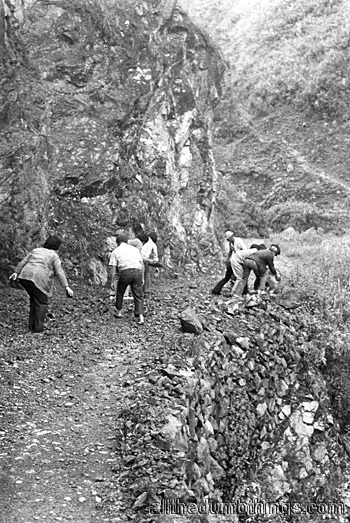 It required balancing on narrow earthen walls that run between the paddies. Failing to do this meant falling knee deep into the rich mud. A few inches to fall but a great loss of dignity, especially to someone so recently acquiring Holy status. To avoid such personal humiliation I decided to take the cowardly option. I volunteered to remain with Rosario to help her cook lunch. My companions immediately rejected this feeble excuse. They assured me that five able-bodied men would be perfectly capable of helping me across. I foolishly gave in. Raymond went first and I went fourth. It was very obvious Raymond had become something of an expert at this art for he was at least 500 yards across the field before the next person dared to put one foot on the low mud wall. It was then suggested by the amused children that we walk crab-like with our arms outstretched for balance. They proceeded to give us a demonstration and, giggling at our discomfort, beckoned us to follow. We did so very reluctantly and very cautiously. The children dodged in and out of us very skillfully obviously enjoying my agonized expressions as they playfully tried to dislodge my footholds. By some miracle, I arrived halfway across safely but then panic set in. Should I proceed or should I return? My common sense definitely dictated retreat. But I had little public support for this idea. It was translated by all as cowardice. Some cheeky toddlers pushed me on before my panic overtook me. But I soon saw, to my horror, some hardened earth had crumbled away just ahead of me. “Jump!” I was advised. But how could I jump, I insisted if I was walking sideways? It would be no mean feat to leap sideways and still retain balance, even for a seasoned expert like Raymond. But to withdraw seemed out of the question. So I stepped gingerly on. Too gingerly, apparently, for, if I had stepped a little quicker I might have avoided my embarrassment. I might have managed to retrieve my following foot or I might never have slipped in the first place. Or so I was informed after the dreaded event had occurred. Not much consolation. What utter humiliation! Not so much in front of my friends but faced by scores of hysterical children, pointing their chubby fingers at this less than infallible Virgin. In their merriment they doubled up with laughter, threatening to eject their infant passengers from the snug safety of the cocoons on their backs. I recovered my composure but defiantly refused to climb back onto the wall. Instead, with my shoes and socks still on, I waded through the squelching mud, accompanied by shrieks of delight from my small companions. After reaching the other side, with what little remaining dignity I could muster, I walked slowly and agonizingly barefoot and silent the rest of the way, keeping my eyes wide open for the occasional snake or scorpion in my path. The ‘witch’ in question, well known locally for her colourful stories and herbal medicines, had at last, after forty-three years of pressure, succumbed to the propaganda of the Belgian Mission. Now, the nun recounted proudly, she was no longer free to recount her “heathen folk tales”, her mouth had been permanently sealed. Nor, it seems, would she be able to practice her famous healings anymore, as she had been convinced that God did not approve. This news left us feeling somewhat depressed. Rosario had promised us a visit to this old woman but now there seemed little point. She would say nothing and do nothing to jeopardize the newly acquired salvation of her soul. And she would, we were assured by the elated nun, attend Church regularly on Sundays from now on. We congratulated the nun and left her to recite her ecstatic prayers of thanksgiving. Instead of visiting the old ‘witch’ we walked a few miles into a neighbouring barrio (village). We passed the local Fawi (Council House) where the tribal elders sit and discuss the problems of the villages. Food had been left out on the stone wall beneath a large sacred boulder to keep the local spirits happy. We then came to the house of a rich and, previously, much-feared head-hunter and local chief. In these parts, a rich man is not determined by his wealth but by the number of goats or pigs he keeps. And also, to some extent, by the family heirlooms, in the form of jewellery, crocodile heads, spears, artifacts and tribal costumes he possesses. In this respect, this elderly chief was very rich indeed. Followed by a group of men, he climbed down the ladder from his nipa hut, proudly carrying great baskets of wealth to show us. 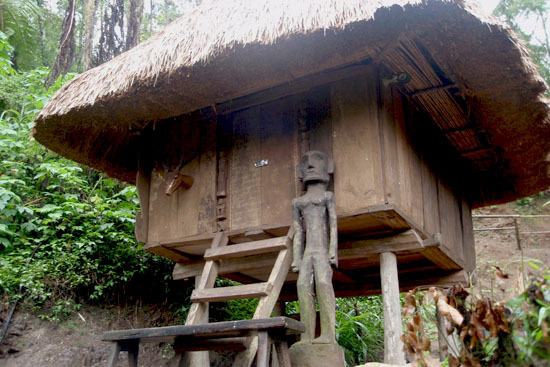 The men laid everything out, very respectfully, on the chief’s massive lagawe bench under his house for us to examine. Rare beads and stones, ancient earthenware carvings, wooden tribal sculptures and Chinese potteries, ancestral carvings and limestone jars, countless spearheads some faded black and white pictures of himself at his wedding, attired in a magnificent tribal dress. They stood back proudly, with folded arms, smiling broadly as we picked up and appreciated each item. 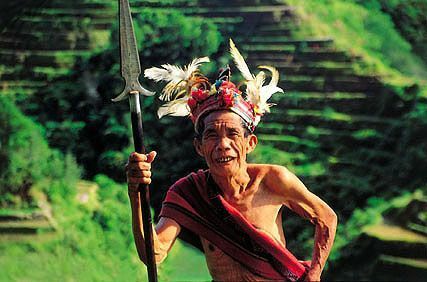 We asked the chief, through the interpreter, if he would put on the headdress for us, which was ornately plumed and beaked to represent a giant hornbill. At first, he appeared reluctant for he was, like everyone else in these mountains, deeply superstitious. But, in fact, he needed little encouragement for also, like everyone else, he was something of an exhibitionist. The chief and his friends were barefooted and attired only in G-strings. And, like all the mountain tribesmen I had seen, he had deformed feet. From a lifetime of gripping the bark of coconut palms and from climbing the almost perpendicular slopes of the Cordillera mountainsides, the soles had spread flat and wide and all the toes turned inwards at a complete right angle. I had noticed several other men with similar deformations but his were quite extraordinary. The exterior walls of his house were covered with carabao horns, spears, goatskin bags, crocodile heads and other trophies. He was very proud to show them to us and kept grinning and nodding as we admired them. Rosario was eager to listen to his local stories. Her interpreter had been farsighted enough to bring along several crates of local beer, carried by our ever-present retinue of children. We climbed the ladder into his house and sat down on the floor or on low wooden stools. In the centre of the room was a warm log fire. And, beside it, a cat was chained to the grate to scare away the mice and rats. Everything inside the one-room house was charred, grimy and blackened from years of soot. Squatting in front of the fire was the chief’s wife and small daughter. Although they smiled at us a great deal, they remained silent the whole evening. It was getting dark by now and there were no candles. Only the flames from the fire lit the faces of the man and those of his friends who had managed to squeeze their way into the room. All were smiling at the prospect of some free beer. The men started drinking and offered us, in exchange, their home-brewed rice wine. It was distilled and served in huge Chinese porcelain jars, scooped into hollow coconut shells with a wooden ladle. When the interpreter thought the men were sufficiently inebriated, she switched on the tape recorder and asked them to talk about their lives and how the Japanese occupation had affected them. They began in turn, hesitantly at first, a little bewildered by the microphone and a little shy of me. But, as the beer passed more freely from the bottles to their mouths, so their tongues got looser. One story the chief related to us was like a fairy tale but he obviously believed it. He said he was sleeping one evening in a tree and was awoken by a strange light. Seated on the ground surrounding the base of the tree were several duende (gnomes). They danced in a circle around him. Then, one by one, they disappeared. Again he saw the strange light but now it was further away. He followed it and it fell from the sky. At the spot where it fell, he found a Neolithic stone. He kept it ever since as an amulet against evil. The chief then produced from his hip a small wooden canister. He opened the lid respectfully, unwrapped the small object inside revealing the stone. After more stories about their lives and about the Japanese atrocities during the Occupation, the men started singing. Surprisingly to us, they were singing in Japanese. Even their own native songs, which they sang in their own dialect, were sung to Japanese tunes. And as they sang they acted out the songs in the cramped space of the smoke-filled room. One man, a village elder, improvised a song about me. This too, although totally spontaneous, was set to a Japanese melody. Raymond taped it and, later, his interpreter translated it for me. “I am poor and barefoot and I see you in your beautiful shoes. I have few clothes and I see you in your beautiful robes. I work in the fields all day and I see the corn colour of your hair. It is alright for me to work all day knowing I shall see you on my return. My eyes are squinting from the sun and your eyes shine brightly. My skin burns with the heat and your skin is pure white. My hands are calloused from my work and your hands are soft. The tune was sad and lyrical. I was both delighted and touched by this impromptu welcome. When the rice wine was finished we made our excuses and left. We heard the men, still singing, as we made our way back across the fields, although the crates of beer had long since been emptied. The next day the old chief came to offer me his collection of anitos (wooden ancestral sculptures) if I would dedicate my hair to his tribe. He said he would keep the hair, along with his other tribal relics, as an amulet to bring the village good luck and good harvests in the future. He asked me if he could christen me the Goddess of Kiangan. When I agreed (although I refused to accept his precious anitos) he grinned and pumped my hand, tears in his eyes. Without waiting for me to change my mind, he removed his fearsome looking bolo (a long native all-purpose knife) from his G-string and promptly, and somewhat painfully, gave me a “healthy” trim that would have sent the high-class hairdressers of Mayfair reeling in dismay. And so, perhaps, to this day, some golden tresses, wrapped carefully in crumbling palm leaves and tied with rattan vines, lie in a small wooden ceremonial box buried deep in the rice terraces in a small Kiangan barrio, along with a fading photograph of me with the chief. Maybe one day an anthropologist will discover the box and wonder about its contents. Perhaps too, the image of me as Goddess or Virgin, (even though my ‘heavenly’ feet slipped into the muddy rice paddies), has been written into the local folklore of that remote village along with the mysterious princess who rose up out of the forest lake in a giant bamboo.